The lens has a focal length of 17-50 mm. Since the lens is designed to be used on a camera with smaller sensor ('APS-C') the focal length will be equivalent to 26-75 mm on your Nikon camera. A feature worth commenting, which is also related to lens brightness, is that the brightness and maximum aperture-value remains constant regardless of focal length used. This makes it easier for you as a photographer. No matter if you are have the focus ring and focal length at 17 mm or at 50 mm the aperture value can be f/2,8. If you buy this lens it will come with a lens hood, whose model name is "DA09". 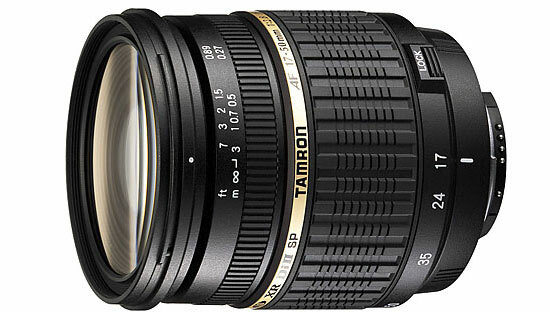 One of two Tamron 17-50mm F/2.8 offerings, the image integrity and compositional options afforded by the SP 17-50mm F/2.8 Di-II´s wide-to-moderate-telephoto zoom characteristics are prized by experienced photographers. Both versions of the SP 17-50mm F/2.8 stem from the long-successful SP 28-75mm F/2.8—originally designed for 35mm film SLRs. Later refined to meet the needs of high-resolution digital SLRs with APS-C-format sensors, and like its further refined variant (the SP 17-50mm F/2.8 XR Di-II VC, model B005), the 17-50mm renders a picture angle range approximating a 26-78mm lens on a full frame DSLR or a 35mm SLR. A fast and constant F/2.8 maximum aperture benefits photographers in several ways, including the ability to render cluttered backgrounds well out of focus, expanded low-light shooting freedom and a brighter viewfinder image. With its mildly less complex optical formula and without tri-axial VC (Vibration Compensation), the SP 17-50mm F/2.8 Di-II (model A16) stands out as a remarkable value and a favorite of passionate photographers. Please note: The 17-50mm became available with a built-in motor for the Nikon D40, D40X and D60 (Model A16NII) from March 2008. The A16N model which had been available up until March 2008 is only compatible with the D40/D40X/D60 in the MF mode due to the fact it doesn´t have a built-in motor." Other (eng): Model A16 but this version adds autofocus motor for Nikon cameras.